The Dome House on Waiheke Island offers you a little something unusual. 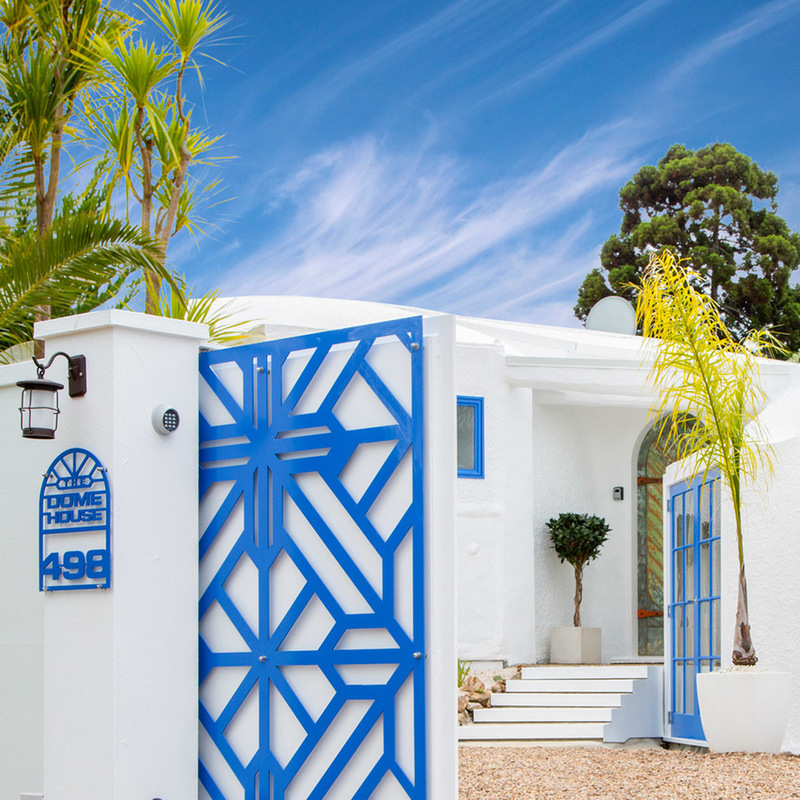 This unique, boutique apartment style accommodation features Mediterranean inspired concrete domes that would blend right in on the Greek Island of Santorini. But you will find them right here, only 35 minutes ferry from Auckland, across the beautiful Hauraki Gulf. Only a short walk finds you at Onetangi Beach, 2.5km of Pohutakawa lined, white sand beach with a great choice of café and dining options. And a short bike, drive or bus takes you to the many other delights that Waiheke offers including 23 Cellar door wineries, award winning and stunning restaurants, adventure tourism destinations, art, music and beaches galore. Free Wifi/ Netflix/ Lightbox / 1,2 & 3 Bed options/ BBQ/ Multiple Outdoor Courtyards/ Private parking/ Electric Gates/ Cleaning included. In 2014 this home under went a meticulous renovation transforming it from a quirky bach into a modern fun space. Utmost attention to detail can be found in the unique features such as hand painted feature doors, wood inlaid concrete floors, and hand made bathroom sinks. The maze of courtyards use feature lighting, amazing cacti, distinctive seating and a bar in the shade to complete the experience. The 3 bedroom house can be split into up several options. Eros is a separate 1 Bedroom Apartment with it's own bathroom, lounge room with TV and basic kitchenette, comfortable super-king bed and a private courtyard with a BBQ. Naxos includes the huge dome lounge and fully functional kitchen and up to two bedrooms (linked) sleeping a maximum of 5. It has one super king bed in the main bedroom, and one queen bed and 1 single in the secondary bedroom. The kitchen is fully equipped with a gas 5 burner, double oven. Naxos courtyards also include a BBQ as well as a unique seating area and a bar with a mini fridge. The whole Dome House can be rented also as one to take advantage of all the above features. All you need to have an amazing holiday with family, friends or and escape on your own!